Gluten & Wheat Free, Low Sugar – Make it Paleo or Plant Based! This recipe is adapted to fit a healthier, low sugar eating plan for you and your family. Especially warming during the holidays! 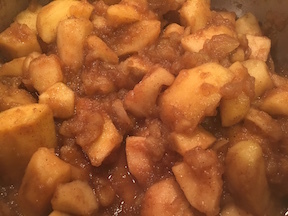 For delicious ginger cinnamon Chunk Applesauce, peel and quarter six large Granny Smith apples and remove seeds. Cut quartered apples into 3rds and put into a large stainless steel or ceramic cooking pot with ¼ Cup of water. 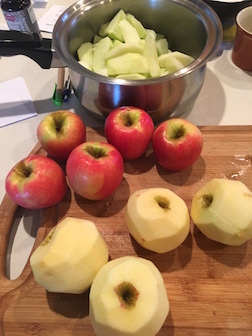 While these harder apples are getting a ‘head start’ cooking on low heat, peel and quarter an equal number (or amount) of sweeter red apples (like Pink Ladies). Quarter these, remove seeds, and cut into larger ‘chunks’. These will cook faster! 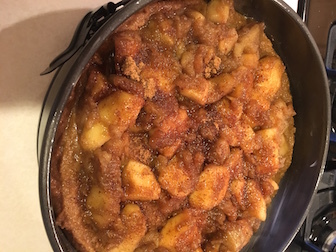 **This will be the topping and will bake with the cake – so you don’t want it mushy. Remove from heat while Granny Smith apples still have a solid form! If you make this the day before you’ll need to hide it in the frig – it tastes like pie filling! 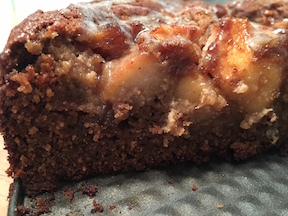 If you’re in a rush, you can use organic chunky applesauce, but it will make a wetter, heavier cake (it will need to bake longer). Making your own applesauce is worth the effort! Leftovers will disappear quickly - or use the rest in Grain Free Spice Muffins! 2. Using a food processor or high speed blender, blend pickled ginger with liquid, vanilla and eggs. 3. 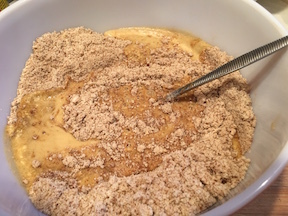 Place ginger-egg mixture in a large bowl and add maple syrup, molasses, cider vinegar and milk. 4. Beat on low until blended well. 5. Add melted butter and softened cream cheese. 6. Ginger ranges widely in its intensity, so taste to see if it needs more maple syrup. Sweeten to taste. 7. Pour wet ingredients into dry, stirring until the flours are moistened. IF the batter is thin enough to pour (like thick pancake batter), it’s all good. If too thick, add a little milk. If too thin, add a few Teaspoons of almond flour. 8. 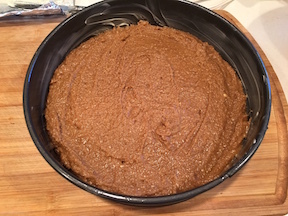 Pour mixture into a buttered 9inch spring-form pan or 9x9 inch square cake pan. 8. Using 2 Heaping Cups of Chunk Applesauce, lightly spread on top of the cake batter. 9. BAKE at 345° 60 minutes. 10. While the cake is baking, mix up a light drizzle of powdered sugar, butter and vanilla. 11. When cooled 20 minutes, drizzle with topping and serve. ENJOY!